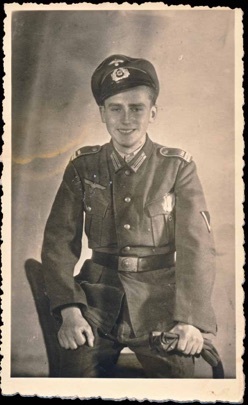 Original WW2 period photo of an Army Gefreiter with an M43 cap On the back, in ink is Greetings from Solvinski? 9 January 1944. Measures about 3.5 x 5.25 inches. Original WW2 period photo of Army EM. Piping is dark like Artillery. His shoulder board embroidered ciphers are either 32 or 33. Dedicated to his sister. Measures about 3.5 x 5.5 inches. 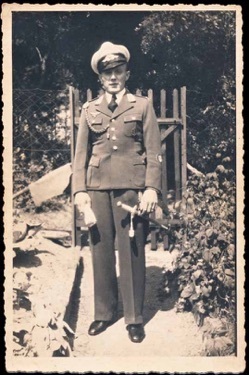 Original WW2 period photo of Army EM in parade dress uniform. Light piping, so assume Infantry. Measures about 3.5 x 5 inches with scallopped edges. Dedication on the back for service time together, November 1938 to March 1939. 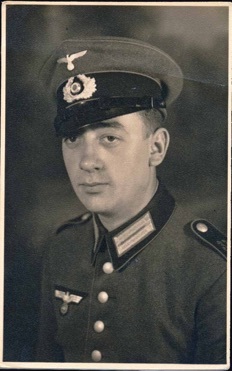 Original period photo of WW2 German Luftwaffe Obergefreiter. Collar tabs look yellow for flight. Back has ink stamp from a Paris photo studio. Measures about 3.5 x 5.5 inches. 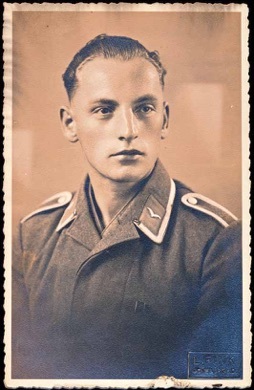 Original WW2 period photo of Army Gefreiter in Infanterie Regiment 125. The Regiment was formed 1938 in Saarbrücken and was sent to the Balkans, early 1941. They formed Panzer Grenadier Regiment 125, and were sent to Afrika October 1942. He wears a RAD pin on his tunic. Measures about 3.25 x 5.25 inches with scalloped edges. 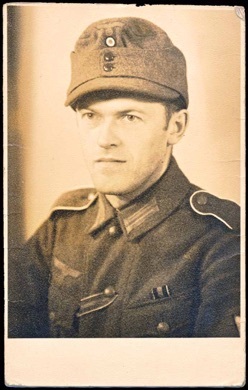 Original WW2 period photo of Army Gefreiter or Obergefreiter wearing M43 cap. He wears Czech Anschluss Medal and Russian Front Medal ribbons Measures about 3.25 x 5.25 inches. Good condition. 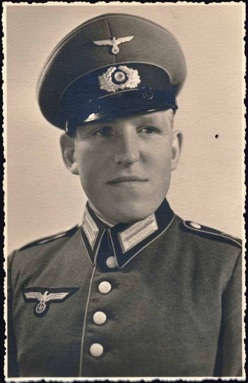 Original WW2 period photo of Army Obergefreiter. 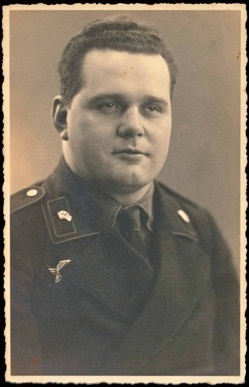 He wears Czech Anschluss Medal ribbon on his tunic. Looks to be infantry. Measures about 3.25 x 5.25 inches. Original WW2 period photo of Army Panzer man, with the piped collar on his black wrap tunic. Back ia marked from a photo studio, Atelier Herold, Neue Koenigstr.2 (Berlin). Measures about 3.5 x 5.5 inches with scalloped edges. 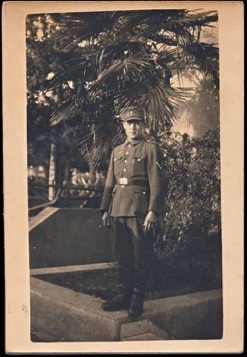 Original WW2 period photo of Army Panzer man with the early piped collar tunic. 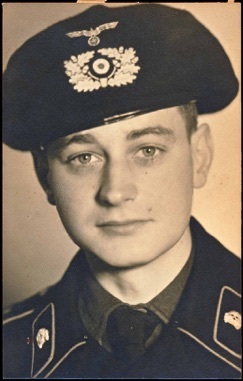 and wearing the Panzer beret with bevo insignia. Measures just under 3.5 x 5.5 inches. 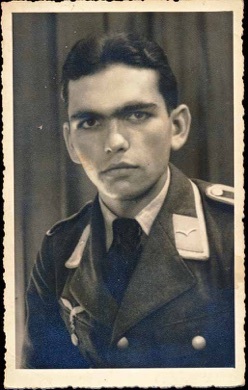 Original WW2 period photo of Luftwaffe Feldwebel wearing a Driver’s Badge on his sleeve and carrying a dagger. Also wears a Marksman’s Lanyard. Measures about 3.5 x 5.5 inches. Back has ink dedication, signed Buby. Original WW2 period photo of Army Leutnant wearing the Iron Cross ribbon and carrying a dagger. Piping is dark, so artillery? 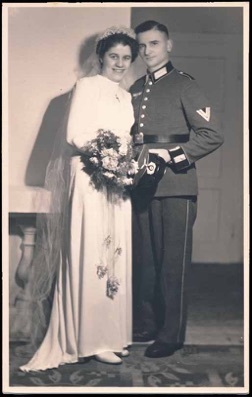 Original period photo of Army Obergefreiter and his bride. His parade dress uniform has white piping, so Infantry. Measures about 3.5 x 5.5 inches. Ink stamp from Photo Studio Bund, Judendorf by Graz. 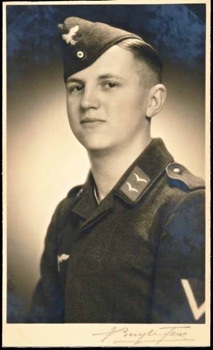 Original period photo of a Luftwaffe Unteroffizier wearing single plave ribbon for the Austrian Anschluss Medal. Embossed from Photo Studio Fink in Osnabrueck. Measures about 3.5 x 5.5 inches with scalloped edges. Good condition with tiny spot to the bottom border. 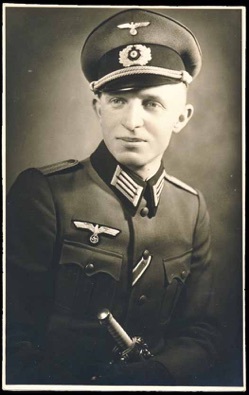 Original period photo of a Luftwaffe Unteroffizier with the earlier drop tail breast eagle on his tunic. Removed from a photo album and with the ink stamp of a photo studio on the back. Measures about 3.5 x 5.5 inches with scalloped edges. 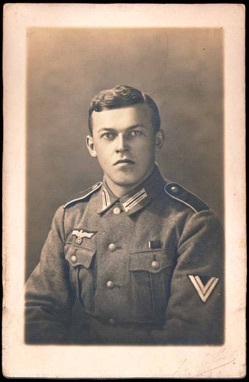 Original period photo of a Luftwaffe Obergefreiter with overseas cap. Dedication on the back, War Year 15 May 1941 and signed Willy Daub..... Measures about 3.5 x 4.75 inches with scalloped edges. 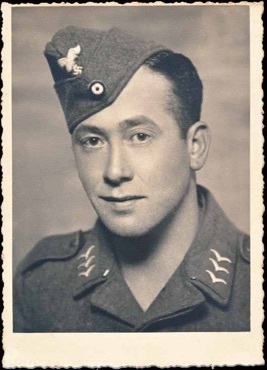 Original period photo of a Luftwaffe Gefeiter with overseas cap. 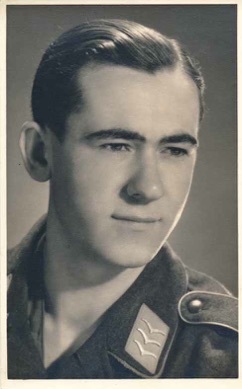 From photo studio Ferd Buyle in Antwerp on the back and signed by the photographer on the bottom front edge. Measures about 2.75 x 4.5 inches.